Are you or a loved one suffering from rheumatoid arthritis, back and neck pain, migraines or chronic pain of any kind? NOW YOU CAN FINALLY DO SOMETHING ABOUT IT. And it can all start in as little as 2 minutes! My patients have been able to eliminate ther most severe pains for the first time in years—without4 risky prescriptions or painful surgeries. One patient with debilitating bone-on-bone arthritis actually REGREW her lost cartilage in just thirty days – and avoided a painful and expensive double knee replacement surgery to boot. Another patient, a retired Army veteran, who went from extreme pain at even the slightest movement to confidently striding across the stage to receive the Distinguished Service Medal. One woman who could no longer walk – and couldn’t even stand on her own – who now takes daily strolls around her neighborhood. There is a single, natural treatment I believe can finally cure chronic pain and it’s been shown to do just that in 90% of the patients who tried it. Even more exciting? I’ve been successfully using it, and other pain-eliminating techniques, on my own patients for decades. The simple fact is, this is an all-natural protocol to protect and eliminate pain and reverse and ever re-grow arthritic joints. Yet government and academic interests continue to hem and haw over it—keeping it off your radar and contributing to the deadly opioid epidemic. In fact, most doctors only receive 9 total hours of pain treatment education in their entire scholarly careers! THAT ALL STOPS RIGHT NOW. This Sunday, August 26th at 3pm, I intend to take you through all of the details…along with my decades’ worth of clinical research (previously unreported by the mainstream media). There are dozens of simple, natural solutions that can help halt–and eliminate–ALL forms of chronic pain. And I’m going to tell you about them. So make sure you tune in to my Pain-Free Life Summit this Sunday, August 26th at 3pm Eastern time. YOUR VOICE: What would eliminating your or a loved one’s chronic pain mean to you? "It would be absolutely heaven. I have had backpain for fifty years. To have relief for even one day would be wonderful. My spine is probably the most painful. I look forward to hearing what you have to say." "The freedom of movement this would give, and the peace of mind knowing that the person's quality of life had been improved along with their health if they no longer needed pain killers." "My retirement, which is blighted by the pain in my knees and back. My fingers are gradually stiffening and anything to reverse this would transform my life." "My wife has beginning arthritis and I want to stop its progression and start healing so that my love is free of any such problem." Fred Pescatore, MD, is one of the most sought-after natural physicians in the country, specializing in making you feel like the best version of you! And in his exclusive clinic in midtown Manhattan, Dr. Pescatore has been using a pain-eliminating therapy with tremendous success for decades. You may have already met Dr. Pescatore on Good Morning America, The O’Reilly Factor, Rachael Ray, The Today Show, Extra, The View, and many more – sharing the latest breakthroughs in integrative and nutritional medicine. And for his expertise in pain solutions specifically, he’s been interviewed and asked to be the keynote speaker on the subject many times. Dr. Pescatore is the author of the New York Times best-selling book, The Hamptons Diet and the No. 1 best-selling children’s health book, Feed Your Kids Well, amongst others. Dr. Pescatore’s other books include: The A-List Diet, Thin For Good, The Allergy and Asthma Cure, The Hamptons Diet Cookbook and Boost Your Health with Bacteria. Dr. Pescatore has his finger on the pulse of natural medicine’s most cutting-edge cures. As a result, everyone from normal hardworking Americans to international royalty are traveling hundreds (sometimes even thousands) of miles to visit at his renowned clinic in New York City. He’s spent over 3 decades studying, researching and practicing medicine around the world alongside some of today’s most well respected physicians. Through his non-stop research and unique medical connections across the globe he hears about the most groundbreaking natural discoveries and healing techniques as they happen…sometimes decades before they trickle out to the mainstream. Dr. Pescatore has spoken on hundreds of radio shows across America. And for years, he was heard daily as the host of the No. 1 health radio show in New York City called, The Logical Alternative. He is currently on the editorial board of Us Weekly magazine and is a regular contributor to In Touch, First for Women and Women’s World magazines. With over 30 years of knowledge in his back pocket, Dr. Pescatore is putting the research, techniques, and in-depth healing protocols right in your hands–and not in clunky medical textbook fashion. Dr. Pescatore makes good health easy to understand and attainable for any age, at any fitness level. His natural approach to healing confronts the modern day cure-all obsession for drugs and surgery that come with countless side effects. And it’s not just his patients that are reaping the benefits. Dr. Pescatore features it all in one of the most exclusive health newsletters available, Logical Health Alternatives. A direct pipeline to one of the most respected minds in natural medicine, written by Dr. Pescatore himself. These cutting-edge cures and simple healing miracles are also shared daily with his loyal readers in his free e-letter Reality Health Check. Behind all the glitz and glamour, Dr. Pescatore is also deeply involved in the philanthropic community, devoting time to working in hospitals in Tanzania, as well as helping to support local organizations for the youth in this country. If he’s not lecturing across America or head deep in clinical research, he often travels around the world lecturing in such exotic locales as India and Japan – usually returning with new medical techniques to share with his patients. After graduating medical school at Columbia University, Dr. Pescatore studied in Southeast Asia, India, Japan, Africa, and Europe. The techniques he gathered have become part of his broad knowledge of healing. His passion for traveling and education has given Dr. Pescatore vast opportunity to research and create some of the best nutritional supplements available today. Coming out with his own line in 2012, NuLogic Nutritionals, Dr. Pescatore has had hands-on experience formulating only the highest quality ingredients derived from ideal climates around the world. 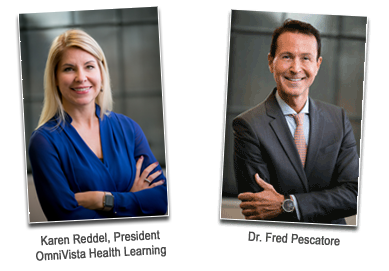 Because of the respect Dr. Pescatore has earned in the nutritional supplement industry, he is a consultant for many firms and has been instrumental in developing and clinically testing many of the leading nutritional products. He is the former President of the International and American Associations of Clinical Nutritionists, a member of the American College for the Advancement of Medicine, and belongs to many other professional organizations.